A high energy, joyous adventure into the music of Django Reinhardt, Cole Pole, Manouche and Swing! Harp Bazaar combine the majestic and delicate sound of the harp with the speed and erratic energy of traditional Gypsy Swing. 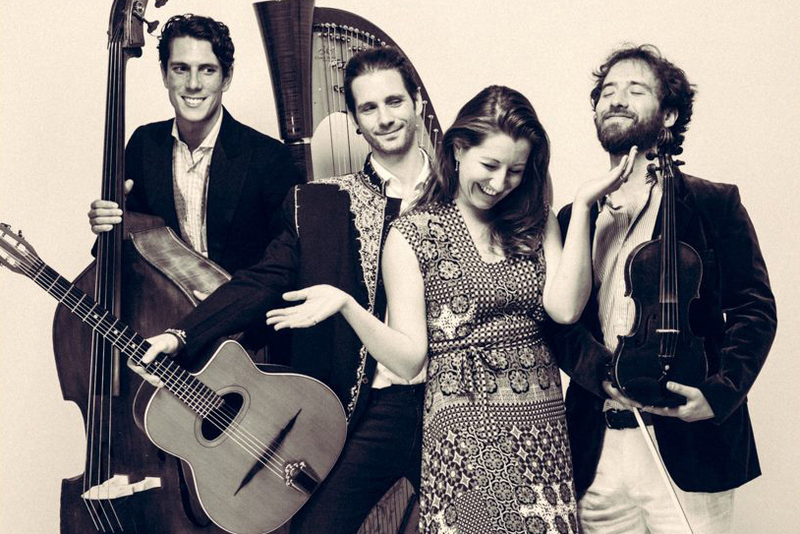 Renowned jazz harpist and vocalist Tara Minton is joined by Italian guitar maestro Filippo Dall'Asta, Scottish fiddle fiend Duncan Menzies and London's own Ed Babar on double bass for an high energy evening of Gypsy Swing. The quartet explore the timeless classics of Django Reinhardt, Cole Porter, French Chanson, Manouche and Swing through the majestic lens of the harp. Harp Bazaar will delight you with rich harmonic soundscapes, lightening fast Gypsy guitar and a joyous energy that is totally infectious!